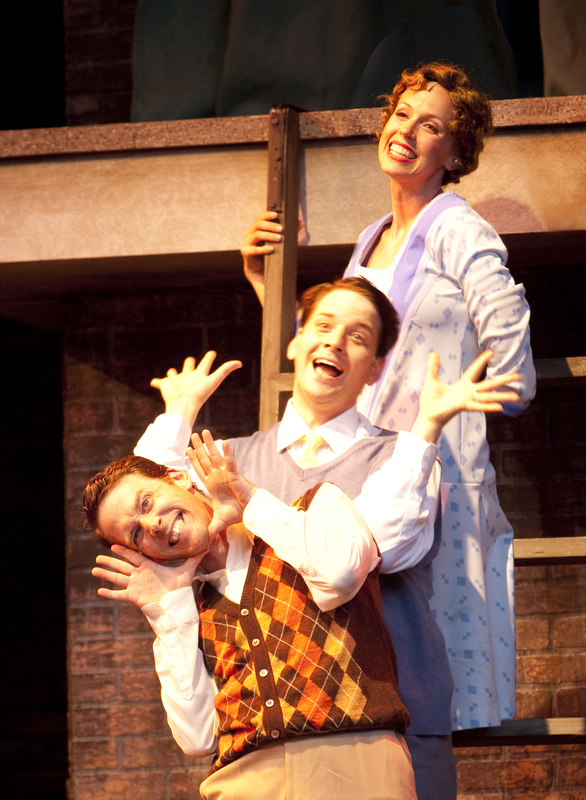 Theatre Under the Stars brings the adapted version of the 1952 film classic Singin’ in the Rain to the Vancouver stage. Neil Minor, Lindsay Sterk, and Lauren Bowler in the TUTS production of Singin' in the Rain. Screenplay by Betty Comden and Adolf Green, songs by Nacio Herb Brown and Arthur Freed. Directed by Shel Piercy (Thoroughly Modern Millie, TUTS), choreography by Shelley Stewart Hunt (Thoroughly Modern Millie, TUTS), and musical direction by Wendy Bross Stuart. Set design by Drew Facey (Thoroughly Modern Millie, Gateway), costume design by Chris Sinosich (Thoroughly Modern Millie, TUTS), video design by Tim Matheson, and lighting design by Gerald King. Starring Cailin Stadnyk (Evil Dead, Ground Zero), Lori Zondag, Fred Galloway (Annie Get Your Gun, TUTS), Jameson Parker, Daniel White, Neil Minor (The Drowsy Chaperone, Playhouse), Lindsay Sterk, and Lauren Bowler (Thoroughly Modern Millie, Gateway). Featuring Natalie Aspinall, Sierra Brewerton, Amanda Buckingham, Sarah-Zoë Catherine, Emily Fraser, Shannon Hanbury, Emily Kapahi, Angela King, Kristina Linden, Jennifer Suttis, Courtney Shields, Linzi Voth, Paul Almeida, Neil Aspinall, Dan Bowman, Angus Chiu, Cameron Dunster, Damon Jang, Joel Lahaye, Alex Nicholl, and Jim Stewart. Theatre Under the Stars presents Singin’ in the Rain on alternating nights from July 10 – August 21, 2010 at the Malkin Bowl in Stanley Park, Vancouver. This year, all seats are reserved, eliminating the need to line up early. Tickets are available online or by calling 1-877-840-0457. Over 40 years after Andrew Lloyd Webber and Tim Rice created Joseph and the Amazing Technicolor Dreamcoat, it remains an incredibly popular staple of school and community theatre. Footlight Theatre mounted a production last fall and Theatre Under the Stars will cap the trifecta with its own version this summer. 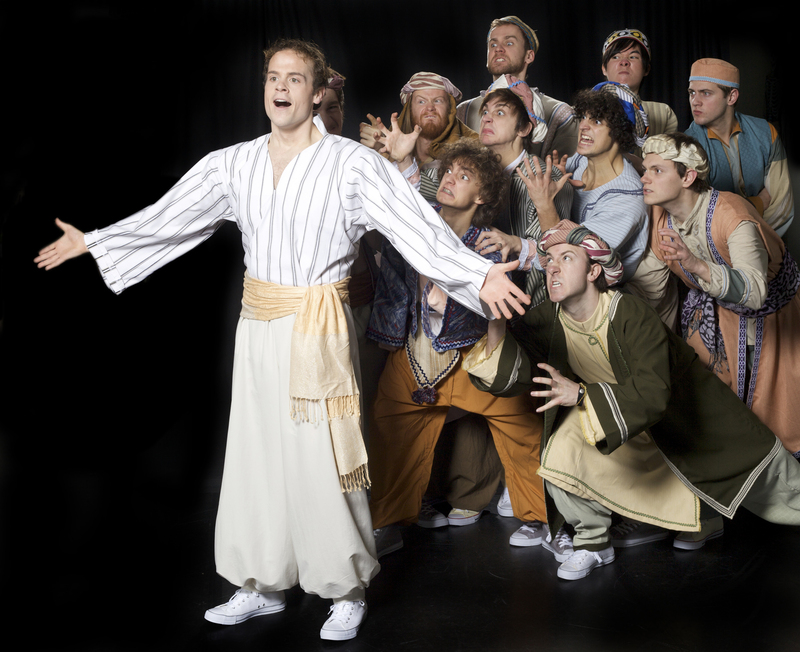 Joseph (Mat Baker) and his brothers in Royal City Musical Theatre's Joseph and the Amazing Technicolor Dreamcoat. This completely sung-through show requires strong vocalists and director Valerie Easton (A Chorus Line, RCMT) has wisely cast accordingly. Mat Baker (Thoroughly Modern Millie, Gateway) stars as Joseph and has a strong, commanding voice. Baker shies away from some of the pop-esque stylings favoured by many other recent Josephs and succeeds because of it. At times, Baker is still a bit wooden, but not as noticeably as he’s been in the past. Joseph is a decidedly male-heavy show, but Jennifer Neumann (Songs for a New World, Not Another Musical) as the Narrator more than holds her own. Neumann is a consistently strong and likable performer and here is no exception. Danny Balkwill’s (Thoroughly Modern Millie, TUTS) turn as the Elvis-impersonating Pharaoh is less memorable, but makes up for it later with a killer Michael Jackson-inspired vocal number. Joseph’s brothers are a uniformly strong ensemble and deserve equal billing with the other stars of the show; Neil Aspinall, Nic Bygate, Tyson Coady, Jeff Deglow, William Hopkins, Erik Ioannidis, Mike Kovac, Myles McCarthy, Daniel Pitout, Friedrick Po, and Lucas Testini. Proving that there really are no small parts, Tyson Coady (A New Brain, Pipedream), who also played Pharaoh’s Butler, was a definite highlight of the evening. His lively characterization and dance steps in one of the large ensemble numbers repeatedly drew attention away from some of the centre stage principals. Valerie Easton does double-duty as director and choreographer and really puts this troupe through its paces. Easton uses the large cast to her advantage, choreographing the stage into a circus of movement. This expanded and now standard version of Joseph does go on too long; there’s no reason for the gratuitous “megamix” that has been tacked on after the finale. By no means is Joseph one of the worst things ever to grace the stage, but it’s quality as a show doesn’t match up with its unbridled popularity with audiences. But, as far as productions go, Royal City’s is rock-solid. Royal City Musical Theatre presents Joseph and the Amazing Technicolor Dreamcoat until April 24, 2010 at the Massey Theatre, 735 Eighth Avenue, New Westminster. Tickets are available online or by calling 604-521-5050.